I love these cookies. Just looking at them makes me happy. Maybe it’s the rainbow of colours from the Smarties that put me in a good mood. Smarties remind me of my childhood. Is it me or do they taste different now? It must be something to do with them changing to all natural colourings and flavorings. I’m afraid I was brought up What’s your favourite colour in the packet? Mine’s Orange, always has been. It’s still my favourite even though I wish they still tasted just like they did when I was little. Preheat oven to 180C/350F. Cream the butter and sugars together in a large bowl until light and fluffy. Add the vanilla and the eggs, one at a time, beating until smooth. In a separate bowl, sift together the flour, cocoa powder, baking powder and bicarbonate of soda together. Add to the butter & sugar mixture and fold in, stop when the dry ingredients disappear into the batter. Stir in the Smarties and white chocolate chips. Form the dough into balls roughly the size of a golf ball. (For smaller cookies, go with the size of a walnut.) Place the balls onto a greased and lined baking tray and space them about 3cm apart to allow for spreading. Lightly flatten the cookies and stud with extra Smarties. Bake for 8-10 minutes. Leave on the baking sheet for 5 minutes before cooling on wire racks. 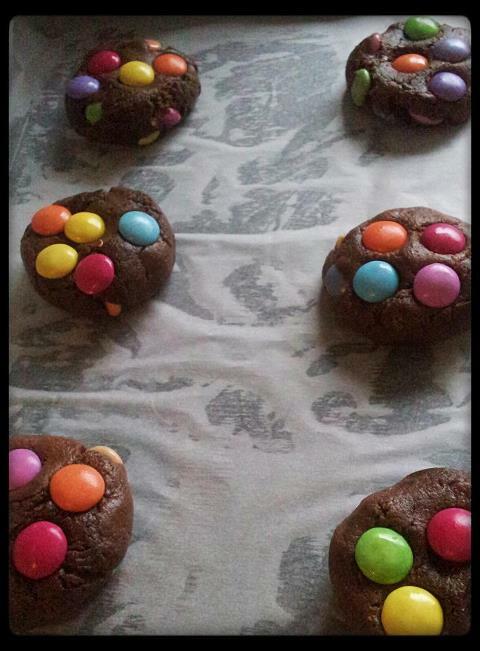 I would’ve never thought to put Smarties in cookies.